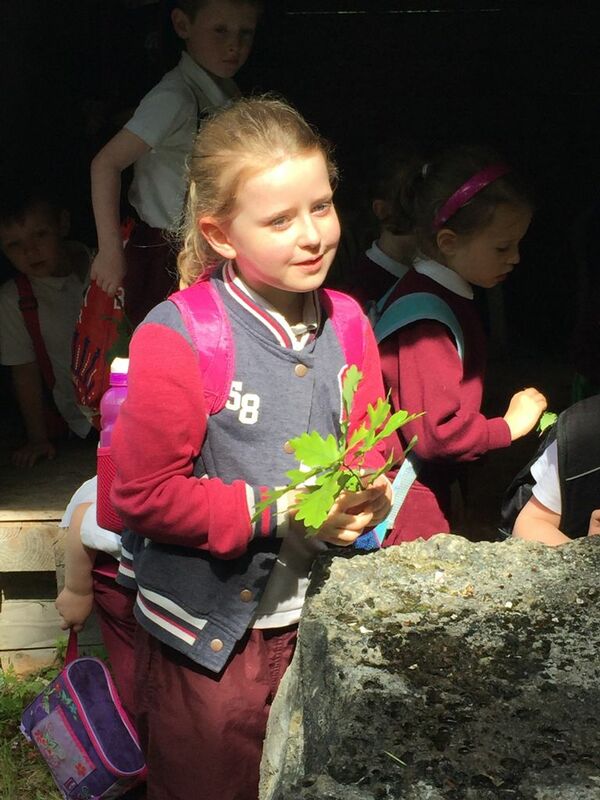 Well, the morning of June 9th was a very exciting one for the pupils of Junior & Senior Infants. 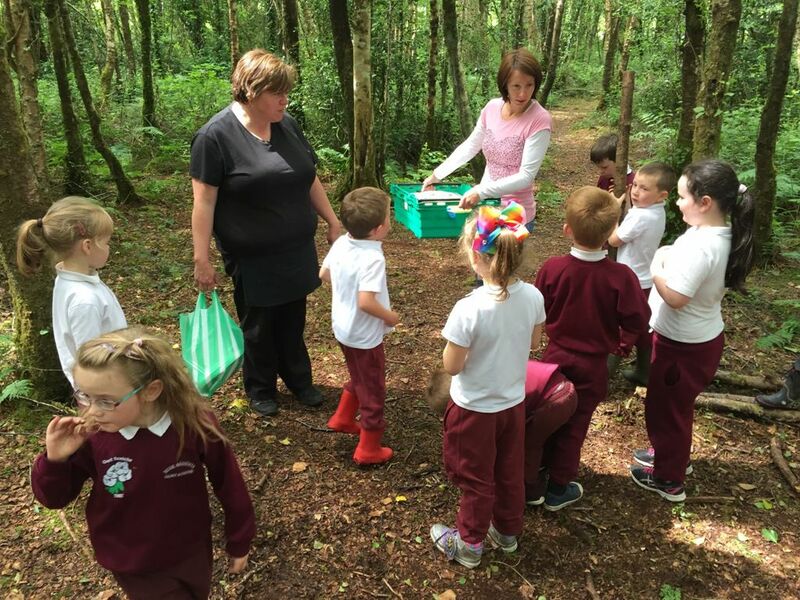 We commenced our school tour woodland walk through Clooncormack Woods in the company of Eugene and Bernice McCartan who very kindly showed us their fabulous nature trail. 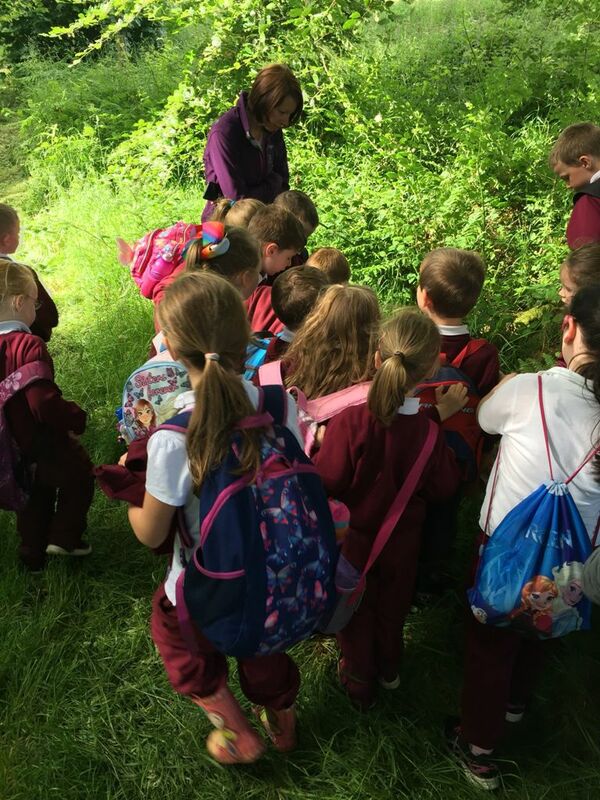 We started our great day out whereby Eugene spoke to us about the trees and showed the children a 300 year old Beech tree. This also had markings of treasure maps on it from the pirates that frequent the woods!!! After this we heard about the Barn Owl and Eugene showed us some nesting sites. These are magnificent creatures that find a safe place like a tree cavity usually over 8ft from the ground to lay their clutch. As the sun sets and the dusk falls each day in the shade of Clooncormack’s canopy, they take flight to go search for food. Next we saw the underground sett of the badger found on an incline. There are usually several entry points to the main sett and each territory is controlled by a family of badgers. As they spend a lot of their time digging tunnels and extending their network of setts, I would say this is where they were when we were visiting Clooncormack woods! 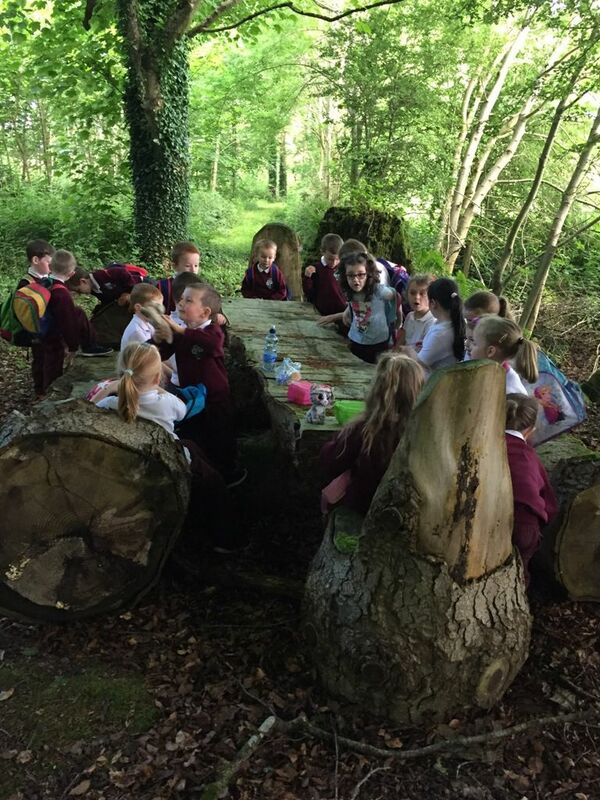 Following our tour guide we were led deeper into the woods to an area where the McCartans have created a beautiful picnic area. 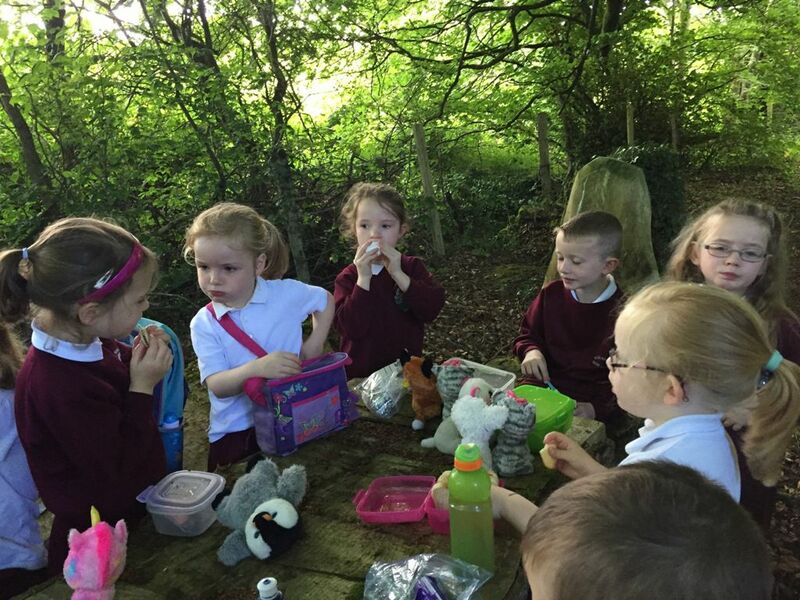 We all stopped for refreshments and our teddy bears’ picnic. The children enjoyed eating ‘al fresco’ and chatting about the different animals and places they had been to so far. Very close by, Eugene showed us the area where often a pine martin frequents. It was here also that Sorsha was sure she spotted something further up the trail, possible our friend the woodland pirate Micky McGoon!!! Then we walked along the edge of the woods until Eugene pointed out the den of Mr. Fox and his family. Again, they are nocturnal animals so we missed seeing the fox as he was probably very busy hunting while we were having sweet dreams. 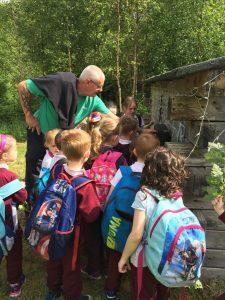 The children loved seeing where all our woodland creatures make their homes. It was so peaceful and calm in the woods during our walk that we could hear different bird calls and see different vegetation under the woodland canopy. Eugene has built a log cabin on the perimeter of the woods which the bats use to roost. The bats hunt over the surrounding open fields and the stream to feast on the abundance of insects in this habitat. The next creature we were all told about was the Otter. The otter is one of our oldest mammals having been found here since the end of the last Ice Age, about 10,500 years ago! 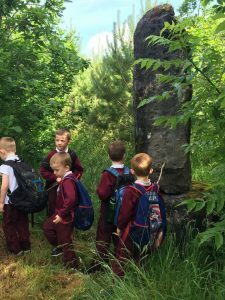 There is a rock in the middle of the stream flowing adjacent to the woods that feeds in to the River Robe and it is here that every now and again Mr. Otter leaves his holt to take a rest. Otters are territorial and usually live alone so he has this part of the riverbank all to himself. 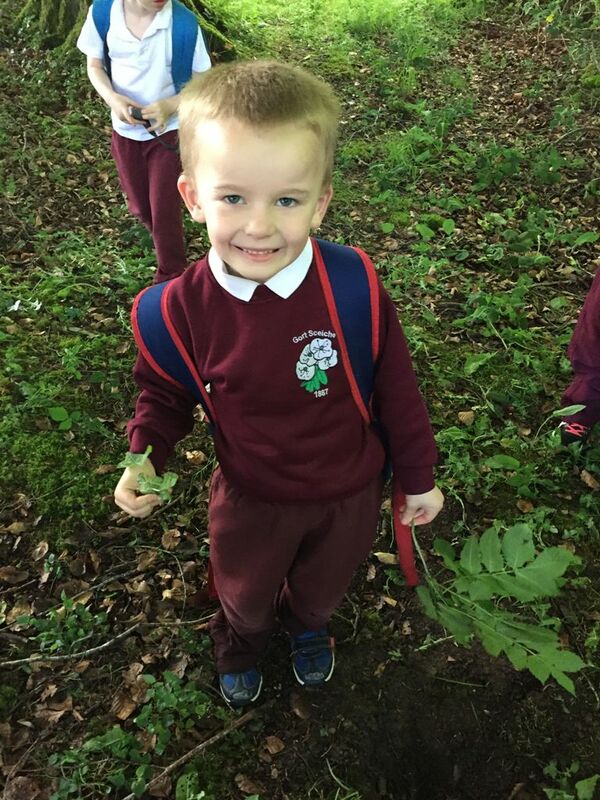 Eugene expertly explained to the children in their own language all about our discoveries. 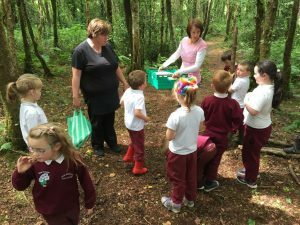 Once we reached camp, the children could go to the composting toilet if they so wished, which is a fantastic ecological feature of this wood. 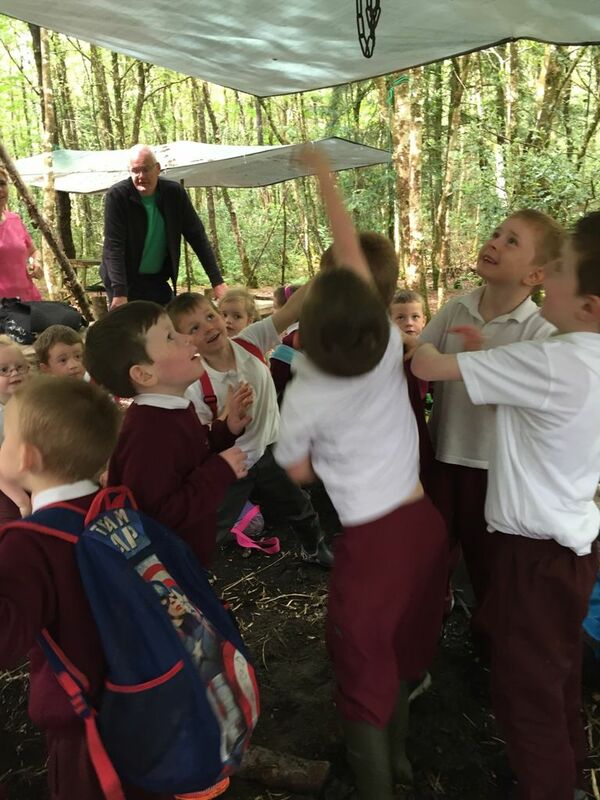 Here at the campsite the children enjoyed their hot lunch and had a sing-song! We all saw where Micky McGoon sleeps at night and got our picture taken inside his shelter!! On leaving the woodland we crossed over the bridge and observed the habitat and home of our spiky friend the hedgehog. 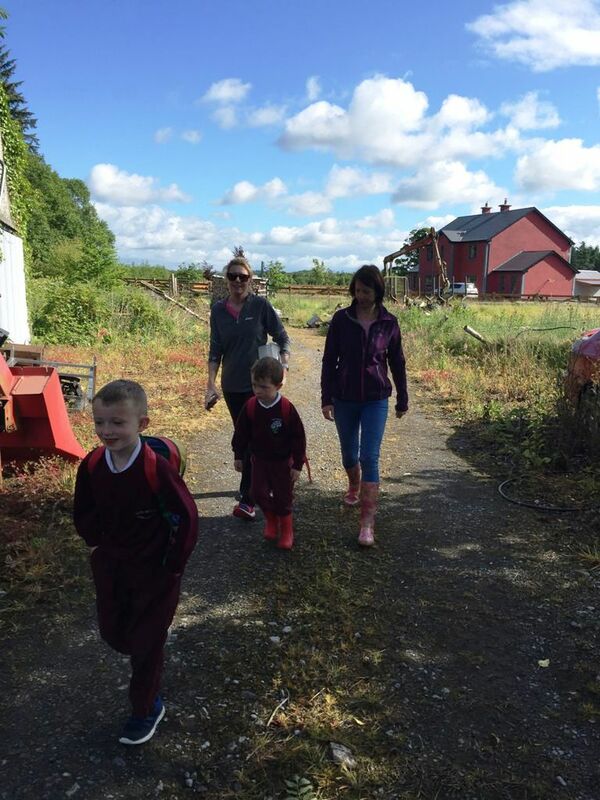 To say the children had a wonderful, educational and energetic day does not do justice to the tour we were brought on by the McCartan’s through their fantastic estate. 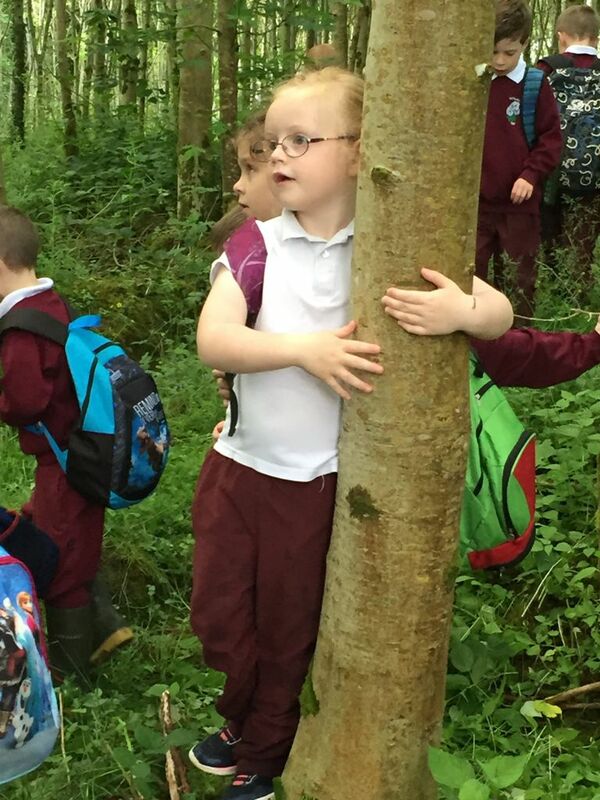 To have such an incredible educational resource and woodland territory so close by is a gift. 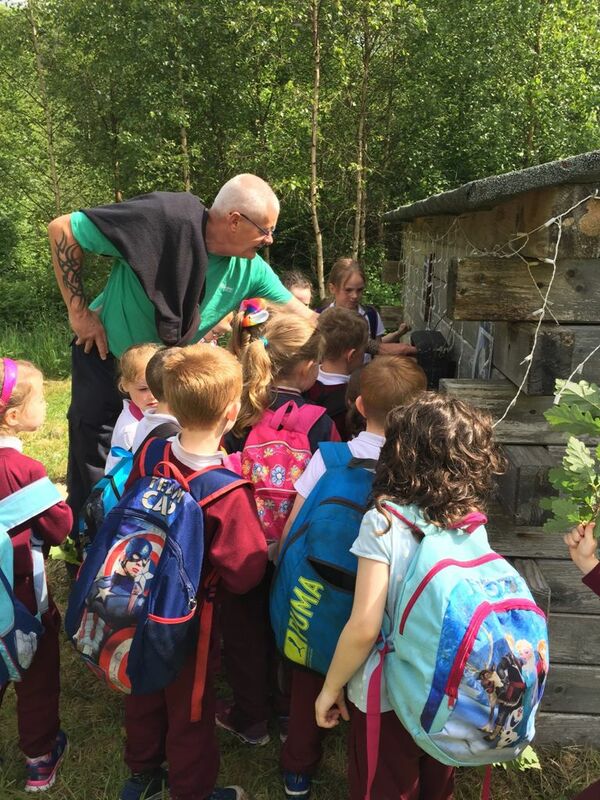 The breadth of knowledge and passion for the woodland that Eugene has is astounding and infectious, in that you go away looking at the hedgerows and surrounding countryside differently and with an added sense of curiosity. Thank you Eugene and Bernice. Please take a few minutes to view the photostory video of our visit, I’m sure you will enjoy it! !